A senior Planned Parenthood official told undercover investigators that its abortionists skirt the federal ban on partial-birth abortion by documenting the use of a poison that they never end up using in late term procedures. Dr. Suzie Prabhakaran, a vice president of medical affairs at Planned Parenthood of Southwest and Central Florida, told investigators at the Center for Medical Progress that she and other abortionists are trained to lie about using poison to ensure that a late-term baby is killed prior to extraction. The nation's largest abortion chain provides its doctors with forms that document the intent to use digoxin to kill a second or third trimester baby before dismembering them in the womb in order to comply with the federal partial-birth abortion ban, according to Prabhakaran. She goes on to say she does not use the drug and that "there's never been a problem" from federal or state regulators tasked with enforcing the abortion ban. "Some people train to just document that like, you know to comply with the partial-birth abortion ban … every time you do a procedure, that's how you document. So, like, there's like a checkbox," she said in the video released Thursday. "I trained to just do the documentation and not do digoxin." Center for Medical Progress President David Daleiden said in a release that the video demonstrates that abortionists at Planned Parenthood only follow the "law on paper," while ignoring it in practice. He called on the Department of Justice to open an investigation into Planned Parenthood's late-term abortion practices and to scrutinize the documents related to the use of dismemberment techniques. "Planned Parenthood medical directors and abortion doctors feign compliance with the federal partial-birth abortion law on paper, knowing full well that ‘what ultimately happens doesn't matter' so long as no one is scrutinizing what they actually do to women and children in the operating room," he said. "The fact that Planned Parenthood has a ‘dismemberment' ‘checkbox' on their abortion forms should tell the public and policymakers everything they need to know about this barbaric abortion business." Planned Parenthood did not return request for comment. The organization has denied any wrongdoing in connection to the Center for Medical Progress videos, which have shown its officials candidly discussing organ-harvesting operations. Planned Parenthood receives more than $500 million taxpayer dollars each year in connection to its birth control and Medicaid operations. Congressional Republicans are now attempting to re-direct those payments to women's health clinics that do not provide abortions. The measure has run into opposition from moderate Republicans. Pro-choice Republican senators Susan Collins (R., Maine) and Lisa Murkowski (R., Alaska) joined Senate Democrats to vote down an amendment to the failed Obamacare repeal on Wednesday. 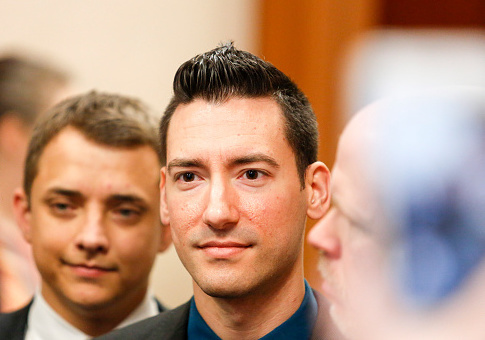 Daleiden called on Congress to continue to fight to defund Planned Parenthood. "The U.S. Congress must stop forcing taxpayers to subsidize Planned Parenthood's brutal abortion empire," he said. Daleiden's videos have landed him in legal trouble. The state of California has charged him and a fellow videographer with 15 felonies for falsifying documents to pose as undercover organ procurers at abortion conventions, as well as invading the privacy of the abortionists captured on camera. A Texas judge threw out similar charges against him in 2016. A California judge held him in contempt on July 17 for continuing to release footage in the run-up to his trial. This entry was posted in Issues and tagged Abortion, Obamacare, Planned Parenthood. Bookmark the permalink.